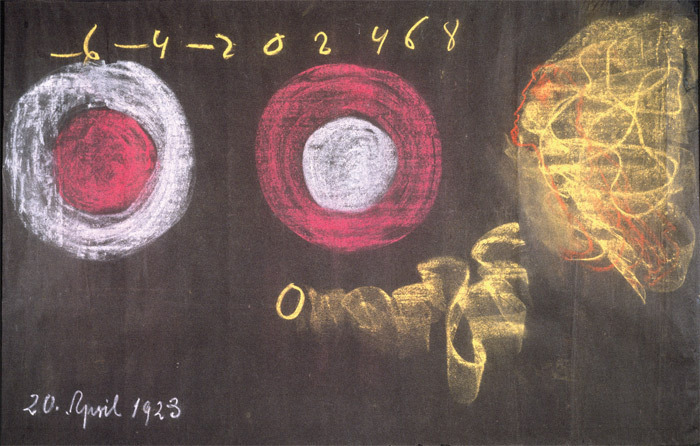 Rudolf Steiner, untitled, 1923, chalk on paper, 40 1/8 x 60 1/4". From the series “Wandtafelzeichnungen zum Vortragswerk” (Lecture Blackboard Drawings), 1919–24. From the “Family of Man” to the “Museum Without Walls,” the vision of a sweeping integration of art and non-art, ancient and modern, canon and fringe, has haunted the history of the large-scale exhibition for at least half a century. This summer, curator MASSIMILIANO GIONI throws his hat into the ring with the Fifty-Fifth Venice Biennale, synoptically titled “The Encyclopedic Palace.” Critic and curator FRANCESCO BONAMI, who helmed the 2003 Biennale, talks with Gioni about the upcoming show and its relationship to globalism, knowledge, anthropology, and idealism.